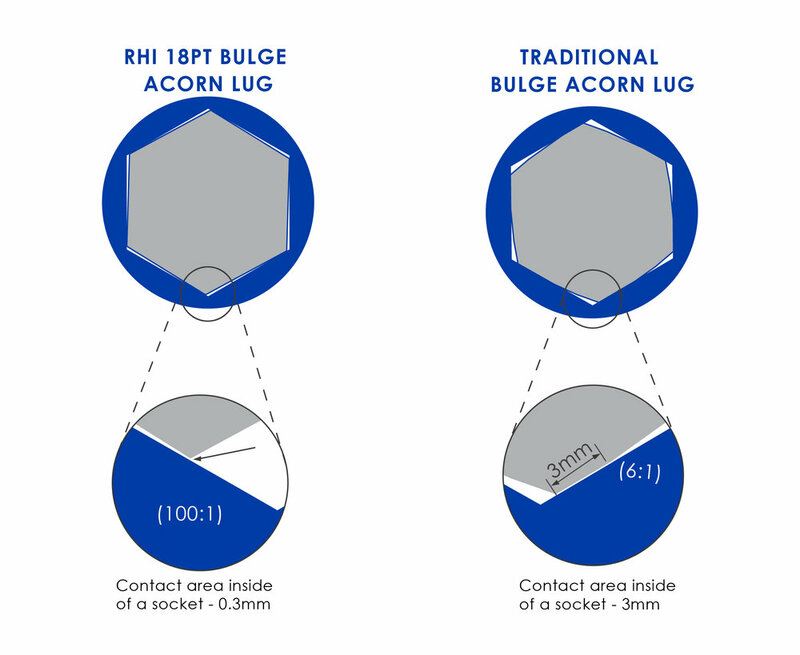 RHI is setting the new standard in lug nut design and technology. 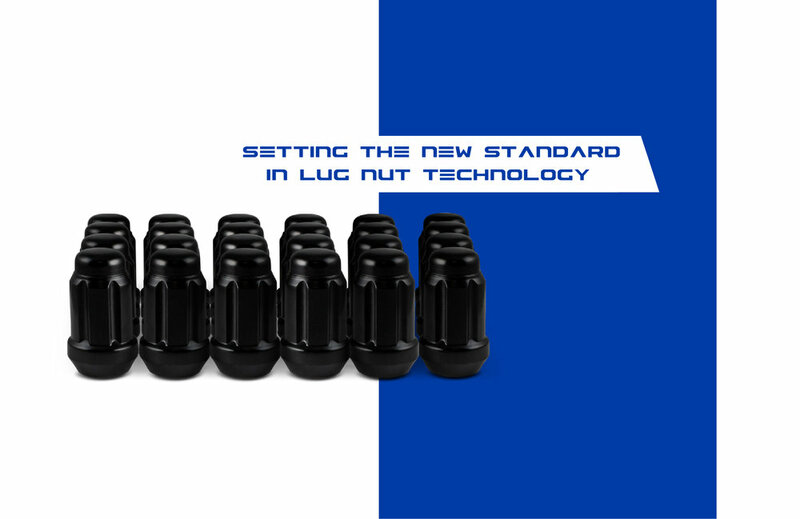 We’ve engineered our lug nuts to surpass the highest standards and quality of OEM. 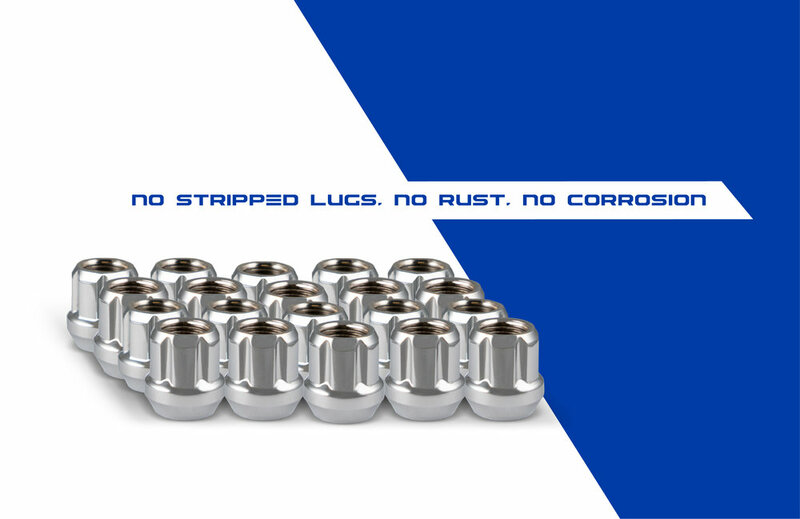 With the addition of our AntiWear Lug Nuts with 18-Point contact and Neoshield coating, these are the absolute finest lug nuts ever produced. Our AntiWear lug nuts are a unique 18-point acorn lug that delivers 3 times greater contact area versus traditional 6-point acorn lug nuts. Eighteen individual points of contact leads to improved torque distribution during installations and significantly reduces the risk of stripping, chipping or rounding corners of the lugs. The result is a lug nut that provides years of reliability while looking as good as it did the first day it was installed. 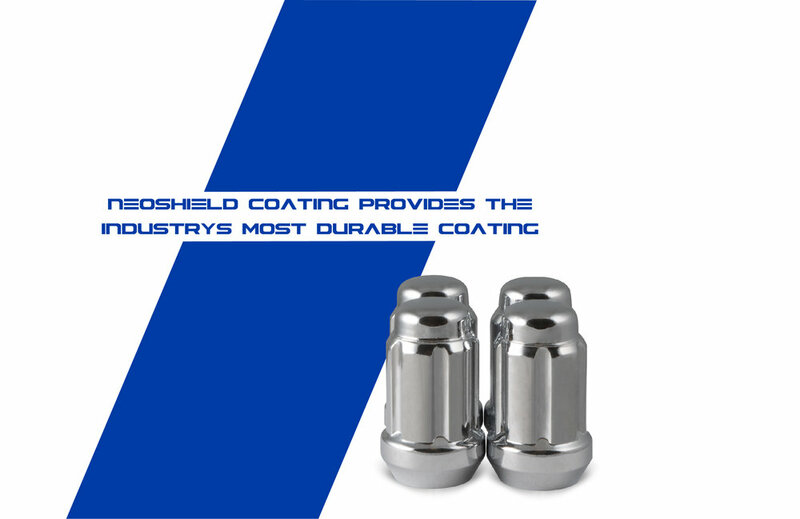 Our proprietary Neoshield coating uses highly advanced nanotechnology to add a special layer to the exterior of fasteners. This unique aerospace coating fuses to the surface of the lugnut and virtually eliminates all porosity. The result is a smoother, shinier and significantly more durable finish that delivers superior protection against rust and corrosion. Our cutting-edge Neoshield design allows our lugs to hold up untarnished in 300+ hours of salt spray testing, which sets RHI as the new quality standard in lug nuts. Two-piece construction with Neoshield coating delivers extreme durability. Triple nickel plating further protects the life of the lug nut. Both chrome plated and black finish exceeds 300+ hour salt spray tests. Cold forged and heat treated for superior hardness and durability. Antiwear 18 point is available in chrome or black. All RHI lug nuts are made of 1045 carbon steel and heat treated to 10.9 grade hardness. Please take into consideration that we do not sell directly to the public. If you have any questions about how to purchase RHI AUTOMOTIVE, please contact an authorized dealer. RHI warrants to the original purchaser that products manufactured by them (“Products”) will be: (1) the Products will be free from defects in material and workmanship under normal and intended use for a period of two years (24 months) from the date of retail purchase; painting defects, chrome plating defects, zinc plating defects are limited to a two year (24 month) limited warranty period from the date of purchase. Surface rust, discoloration, and corrosion which are direct results of improper installation, are not covered by this Limited Warranty. This warranty does not cover any item that has been damaged, mutilated, altered, misused, abused or forcibly removed. RHI’s sole and exclusive obligation under this Limited Warranty shall be to repair or replace at RHI’s sole discretion, without charge, any Product that does not conform as warranted herein and is returned with a copy of the original sales receipt or satisfactory evidence of date of purchase to the dealer from whom the Product was originally purchased or to RHI. Such repair shall not include incidental charges such as removal, installation or shipping. In no event shall RHI be liable for special, incidental or consequential damages. RHI reserves the right to make changes in specifications and design without any prior notice or incurring responsibility. Products replaced under warranty will be covered for the remainder of the original Limited Warranty in place for that specific Product at that time. [a] Corrosion or damage occurred due to improper care and installation. [e] The Products have been altered or repaired or installed on customized vehicles (i.e., non-original equipment, or non-OEM parts). [f] Damage resulted from excessive vehicle loads, and/or improper installation. This limited warranty is the express warranty given by RHI and is in lieu of all other warranties, whether written or oral. This Limited Warranty expires upon transfer of title of any RHI Products by the original retail purchaser. The Products are not designed to be installed with any accessories or adapters other than those supplied or approved by RHI and any damage caused by any such other accessories or adapters is not covered by this warranty. OTHER THAN AS EXPRESSLY STATED HEREIN, RHI GIVES NO WARRANTIES HEREUNDER ON THE PRODUCTS AND HEREBY EXPRESSLY DISCLAIMS ANY AND ALL OTHER WARRANTIES, INCLUDING ALL IMPLIED WARRANTIES OR CONDITIONS, OR WARRANTIES OR CONDITIONS OTHERWISE ARISING BY OPERATION OF LAW, INCLUDING IMPLIED WARRANTIES OF MERCHANTABILITY AND FITNESS FOR A PARTICULAR PURPOSE, TITLE, AND NONINFRINGEMENT. Disclaimed Liability. In no event will RHI be liable to any purchaser arising out of any claim, demand, suit, action, allegation, or any other proceeding involving Products that have been altered or repaired other than by RHI or installed on customized vehicles (i.e., non-OEM vehicles). © Copyright 2018 RHI Automotive All Rights Reserved.